Rob Pruitt, Looking, Longing, 2008. Installation view: St. Jude Children's Research Hospital, Memphis, TN. Photo courtesy of RxArt. One of the experiences that I miss the most about working in a museum is the luxury of having immediate access to art. When I was an employee at The Metropolitan Museum of Art, long and stressful days demanded breaks, and I often strolled through the galleries to take my mind off of work. There is one particular Stuart Davis painting, with a strategically-placed bench opposite from it, that always seemed to do the trick—just the distraction I needed before jumping right back into a project. The ritual of staring at this painting was essential for getting through the toughest days. RxArt provides a similar comfort to medical patients in hospitals across the country. The organization—celebrating its 10th year—inspires hope in hospital guests by way of placing contemporary art in the halls and rooms of healthcare facilities. I spoke with RxArt founder and president Diane Brown to learn more about how these installations come about, and how patients, family, and medical staff alike have responded to the works. Jonathan Munar: From what I’ve read, the origins of RxArt trace back to you, a CT scanner, and visions of Matthew Ritchie-esque figures covering the walls. Can you tell us more about how you came up with the idea for RxArt? Diane Brown: I was working as the curator of a corporate collection and had a medical problem necessitating a CT-Scan. I found the experience frightening—frightening mainly because I was afraid the doctors would find what they were looking for—but additionally, the staff was humorless and cold (not that I expected a vaudeville team) and the room was totally stark. There was nothing comforting in any way, and coupled with a high level of anxiety, it was a miserable experience. I did not actively try to picture an artwork, but my subconscious took over as a defensive mechanism and I imagined a work by Matthew Ritchie. It was sufficiently complex that it kept me busy during the scan. JM: Flash forward 10 years later, and a CT scanner comes back into play through an RxArt installation at the Advocate Hope Children’s Hospital in Oak Lawn, Illinois by Jeff Koons. Was that deliberate? How did the project come about? DB: I was invited to Chicago by a pediatric radiologist working at Advocate Hope Children’s Hospital. We toured the hospital, met with members of the hospital administration and discussed a collaboration between RxArt and Hope. Since the contact had been initiated by a radiologist and because it had always been my hope to have an artist work directly on a CT-Scan machine—we decided to make that the site of our first installation together. We made a wish list of artists for the project and Jeff Koons was our first choice. We were very fortunate in that Jeff understood the project and agreed enthusiastically. Jeff Koons, CT scanner and examination room, 2010. Advocate Hope Children's Hospital in Oak Lawn, IL. Copyright Jeff Koons. Photo: Michael Tropea, Chicago. Photo courtesy of RxArt. JM: How have artists typically approached the site-specific projects? What variables are considered? DB: Each project is different. The type of patients on the unit must be considered first—both in terms of imagery and also in materials used. JM: In addition to site-specific commissions, RxArt also installs original works in facilities. How do you approach these types of installations? What is the relationship between the art and the environment, and how does it differ—if at all—from that of a gallery or museum space? DB: Our installations are increasingly site-specific, but even if individual works, not related to one another, are installed, the patient audience is considered when we select artists and artworks. We believe that the art we install should be challenging in a positive way. We want to give the patients something to look at that will make them think—we are not asking them to be art professionals, just to look at something that requires a bit of exploration, be it visual or conceptual. In a gallery or museum you have a lot more freedom in selecting the art you display. If someone doesn’t like it, they can always walk out. In a hospital the patients are not as lucky. We don’t want to install art that will be upsetting in any way or unappealing to the patients or the staff—who are there every day. JM: Have there been any site-specific projects where yours or the artist’s vision was inspired from personal experiences or connections to the mission/focus of a particular healthcare organization? Do artists often approach you with an idea for a project? DB: Jason Middlebrook’s project, Traveling Seeds, in the bone marrow transplant unit at Mount Sinai is an example. The environment and man’s relationship to it has always played a major role in Jason’s work. Jason spoke to the project sponsors, Bob and Mollie Myers when he was first asked to give us a proposal. He understood that Bob had survived non-Hodgkins lymphoma thanks to a bone marrow transplant at Mount Sinai and wanted to create an artwork that addressed the gift of life that bone marrow transplants offered. Jason Middlebrook, Traveling Seeds, 2007. 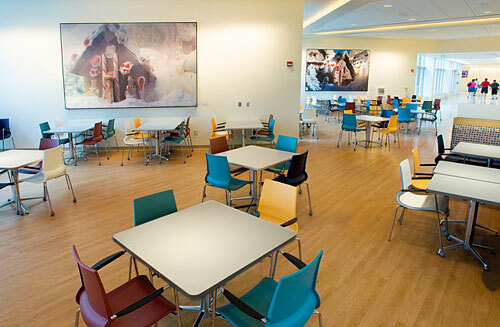 Installation view: Mount Sinai Hospital, New York, NY. Photo courtesy of RxArt. JM: Have there been moments where the audience reactions are not what you would have expected or anticipated? DB: Yes. We installed work in an early project that my selection committee and I felt was uplifting and cheerful. The hospital staff and administration reviewed the work and agreed. Once we installed the work, some patients had a different response. I don’t think they understood the artist’s intent, but that was really irrelevant. What mattered was that the patients were upset by some images, so we removed them immediately, replacing them with work that was a better fit for that particular audience. JM: What are some of your favorite memories from the first 10 years of RxArt? What are some memorable reactions that you’ve had from medical staff? From patients? DB: Each project has great memories. The project at St. Jude Children’s Research Hospital is one of my favorites. It involved two artists: Will Cotton and Rob Pruitt, both outstanding artists and wonderful people. We took three trips to Memphis together in the course of the project. Our first trip was to present our ideas to the Board of Directors at St. Jude. We had a 6 a.m. flight! The artists were great sports, agreeing to embark on this marathon day. When we arrived in Memphis we were taken on a tour of the hospital, which was tremendously inspiring. Following the tour we presented our proposal to the board of directors. Marlo Thomas was especially enthusiastic about Rob’s glittery panda paintings. Because the air is exchanged constantly at St. Jude for purposes of sterility, the glitter posed a problem. A Plexi box around the painting would have solved the problem, but Tony Thomas, Marlo’s brother and fellow board member, was insistent that there be nothing between the children and the art. Rob was faced with the challenge of creating works that were as lively and animated as the panda paintings Marlo admired, and totally safe for the children as well. His solution was to use Spangly Board—mylar disks on hooks which attach to strips of wood. The disks float on the hooks and move with any breeze or air currents. Spangly board is used on outdoor signs such as car wash signs—but not often in New York City! We ordered spangly board from as many sources as we could find and everyone in the office tried their best to pull the spangles off the hooks. If we succeeded, we couldn’t use that particular product. We hired a toxicology expert to give us specs on the material to be sure it was totally safe for the kids and then sent it to the hospital for their examination. Will Cotton, Mist and Gingerbread House, 2008. Installation view: St. Jude Children's Research Hospital, Memphis, TN. Photo courtesy of RxArt. Will created 2 very large paintings of gingerbread houses. With help from the administration at St. Jude, he was able to invite a 3 year old child who had been successfully treated for a brain tumor at St. Jude, along with her mother and older siblings, to his studio to decorate gingerbread houses. Will baked the gingerbread, and had all the candy and frosting on hand for decorating. The house you see in the center of his paintings at St. Jude was decorated by this little girl. Her siblings also decorated gingerbread houses, which make up the gingerbread village in the background. The oil paintings too had to be accompanied by a toxicology report. Oil paint is toxic if ingested. The report deemed the paintings safe thanks to the acrylic varnish on the surface. A child would have to lick off all of the varnish, which would be quite a task or literally chew the painting for it to be unsafe. Flights between New York and Memphis were not that frequent, so on our first visit to Memphis we had several hours between our presentation at the hospital and our flight. None of us had ever been to Graceland before. Will treated us all to the deluxe tour. On our second trip to Memphis—for the actual installation of the work, we visited the Memphis arboretum in the hours before our flight home. After going to sample Memphis Barbecue and before heading out to the arboretum, we went back to the Kafe to look at the installed work one more time. It was magical to see children blowing on the spangles and waving their arms in front of them—really engaging with the work. Our third trip was for the official ribbon cutting to open the Kay Kafe where Rob and Will’s work was installed. As the ribbon cutting was in the morning, we arrived the day before, returning home after the ceremony. JM: Does anyone ever visit the facilities just to look at the art? DB: The art is installed in working hospitals. People on the floors are either ill or recovering from serious illness. The artwork is intended for the patients, their families and the medical staff. It is not really appropriate for the public to visit the facility for the purpose of looking at the art. There are of course exceptions. We take the donors through our projects so they can see first hand, what their contributions have made possible. We also have taken prospective donors to visit projects so they can better understand what we do. Some projects lend themselves more to outside visitors than others. We try to concentrate on those installations when showing visitors what we do. Raymond Pettibon's contribution to Between the Lines, Volume 2. Courtesy of RxArt. JM: Then, of course, there are the coloring book projects—Between the Lines Volumes I and II—which anyone can enjoy, and which many already have. How did those projects come about? Did you expect them to be so popular both in and outside of the healthcare setting? Can we expect a Volume III any time soon? DB: We hope that children will look at and enjoy the art we place in the patient waiting areas and treatment rooms, but I wanted to give the children something that would really occupy their minds and allow them to forget that they were in the hospital. I know that pediatric units also have teenagers in them. I did not want a teenager to be insulted by getting a coloring book. I think it must be hard enough for, say a 16 year old, to be in a pediatric unit. The idea behind the coloring books was for them to be interesting for every age—small children to adults. Many people have told me that their children don’t usually like coloring books because they are afraid they will go outside of the lines. Some of the drawings in our books make it impossible to color within the lines—giving the children the freedom to color wherever they like. We asked the artists for line drawings that were representative of their work—we didn’t want them to make a drawing for a “coloring book,” just a line drawing. If someone thinks they are too old to color, they can just look at wonderful drawings. JM: What can you tell us about RxArt’s upcoming project with Terry Richardson for Kings County Hospital in Brooklyn? DB: I’m sure you have seen photographs of Terry and other celebrities and friends with their thumbs up. In our last benefit we had a fabulous photograph of Terry and Obama, both with their thumbs up. For this project, Terry took photos of small children, all giving the thumbs up sign. You can’t look at them without smiling. It is sending such an optimistic message—from these small, healthy children to children in Kings County who hopefully will be smiling and holding their thumbs up soon. JM: Can you share details about any other forthcoming RxArt projects with us? DB: We have several exciting projects ahead. We expect to be installing paintings in the next few months by Chris Johanson in Chicago in La Rabida Children’s Hospital, an inner city hospital devoted primarily to behavioral health. This project will be completed in 2011. We are also in the early stages of a major project in the Craniofacial Center of the University of Illinois, Chicago. We hope to finish the Craniofacial Center project in late 2011. Also at an early stage is an exciting project in the imaging unit at Memorial Hermann Children’s Hospital in Houston. This will include a waiting area and at least one CT-Scan suite—much like the Koons project we completed in Advocate Hope Children’s Hospital in Chicago last summer. Closer to home, we are working on a major installation by Yoshitomo Nara in the new Pediatric C-Pep unit at Bellevue Hospital in NY, part of HHC. Nara has toured the space and has received plans and elevations. We have discussed his proposal with HHC personnel and we are waiting to see drawings.